Robert De Niro and Al Pacino are finally together on screen in this riveting story about an intense rivalry between expert thief Neil McCauley (De Niro) and volatile cop Vincent Hanna (Pacino). McCauley will stop at nothing to do what he does best and neither will Hanna, even though it means destroying everything around them, including the people they love. With a solid supporting cast that includes Val Kilmer, Jon Voight, Ashley Judd, and Natalie Portman, Heat is a truly epic crime story. Talk about high expectations! 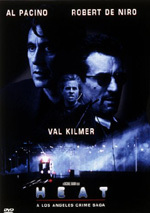 In 1995, a movie paired Al Pacino and Robert De Niro for the first time since 1974's Godfather II. The publicists for Michael Mann�s Heat really pushed this angle and marketed the movie with a "when actors collide" angle. The ads also indicated that this was the first time the two actors appeared in together, which was technically correct; while Pacino and De Niro both starred in the second Godfather, their stories were told independently and the two never crossed paths. Unfortunately, Heat didn't offer much more "interactive time" for the two than the zilch we'd seen in Godfather II. While the characters Pacino and De Niro play are clearly intertwined - basically, Pacino's Vincent spends the whole movie trying to arrest De Niro's Neil - they spend very little time on screen together. There's one sequence in the middle of the film, and one at the end, and that's it; other than those ten minutes or so, the two never share a frame. When I saw Heat during its theatrical run, I didn't much care for it. 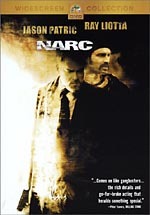 The expectations about the whole De Niro/Pacino thing, the great reviews � it all built the picture up too much and I just never connected to it. To be frank, I can't remember what exactly I didn't like about it, but I chalked it up as just another disappointing piece of work from Michael Mann. 1986�s Manhunter was okay, but I couldn't stand Last of the Mohicans. 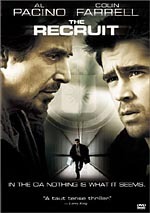 Now that it's out on DVD and I've heard all of the raves about it one more time, I decided to give Heat another shot. I'm happy I did. The film's not perfect by any stretch of the imagination, but it's a good sight more exciting and provocative than I'd recalled from my initial screening. Of course, the acting gets most of the attention here, and most of that notice falls upon the two leads. Both are solid, although Pacino tends to fall back upon his loud, hammy mode too often; too many of his lines are delivered too broadly. De Niro, on the other hand, offers one of his most nicely understated performances. He doesn't rely on broad gestures or volume to deliver the strength of his character, and ultimately this makes him much more memorable and effective. It also nicely balances the excessive bravado of Pacino. One fact that tends to get lost along the way is the stellar nature of the supporting cast. Even though Val Kilmer was a pretty decent star at the time, he couldn�t muster above third billing here. The cast also features notables like Tom Sizemore, Ashley Judd, Ted Levine, Jon Voight, Natalie Portman, and many others. That's a strong group. I can't really say that any member stands out, but they make for a tremendously solid ensemble. As far as the movie itself goes, much of the fan focus sticks on the action scenes, and they definitely make a strong mark. However, what most impresses me is the emotional depth of the film. Outwardly, Heat seems to be little more than an exciting game of cops and robbers, but it really is concerned with viewing how the decisions we make affect our lives. These are extreme cases, since so many of them literally are life and death, but they nonetheless can be generalized toward those of us with less frightening - or exciting, depending on your interpretation - existences. Heat really tries to posit the balances we have to make between our hearts and our heads, and how we deal with that. It's not the most exhaustive study you could want to see, but it's a surprise from this kind of a film, and it's very effective. Heat appears in an aspect ratio of approximately 2.35:1 on this single-sided, double-layered DVD; the widescreen image has been enhanced for 16X9 televisions. Parts of the transfer looked solid, but too many problems occurred for this to be a consistent presentation. Print flaws created the biggest distractions, with a particular emphasis on white specks. Those popped up quite frequently throughout the film, and I also saw occasional examples of black grit and other small marks. Moderate digital artifacting gave the movie a grainier and less stable look than it should. While the source defects caused the most serious issues, other parts of the transfer seemed less than exemplary as well. The movie almost always looked very sharp - perhaps too sharp. The film took on an artificial crispness at times that made it appear a bit harsh. Still, the definition was usually positive and served as one of the image�s better aspects. Unfortunately, it resulted in instances of jagged edges and moir� effects, and I also saw mild to moderate edge enhancement. The movie might be called Heat, but the color scheme went for a decidedly cool look. The flick favored a bluish-green tint that kept things subdued. The DVD replicated the tones appropriately; the tones never came across as particularly rich, but they seemed satisfactory within the constraints of the visual design. Blacks were less satisfying. They usually stayed reasonably deep, but they occasionally tended to lean toward moderate inkiness. Low-light shots were also a bit murky and bland. Enough of the transfer seemed solid to merit a �B-�, but I thought it had a lot of room for improvement. Although the Dolby Digital 5.1 soundtrack of Heat didn�t suffer from the obvious flaws of its visuals, it also wasn�t consistently effective. With a few notable exceptions, the soundfield maintained a strong emphasis toward the front. Matters opened up fairly well for the more action-oriented sequences, and those managed to create a decent sense of life. Otherwise, the mix stayed stuck in the front, and somewhat awkwardly at that. Elements occasionally appeared a bit �speaker-specific� and they didn�t blend as naturally as I�d like. Nonetheless, they usually combined adequately to form a satisfactory feeling of place. The score added good stereo imaging as well. Most of the audio sounded good, as my only complaint came from the way the mix balanced dialogue. During a few scenes, I found it tough to hear the lines. Despite those periodic obstacles, speech otherwise sounded concise and distinctive. Music showed good range and definition, while effects were crisp and detailed. As I mentioned during my discussion of the soundfield, the track didn�t present a lot of opportunities to blast, but the audio kicked into gear well when necessary. Overall, this was a good but unexceptional mix. If you want lots of extras, you won�t find them here. Heat includes nothing more than three trailers, and they�re not very good ones. Actually, all three are pretty similar. Many people don't see any point to rewatching films that they liked, much less ones that they didn't enjoy, but my second viewing of Heat establishes the usefulness of doing so. A few hours ago, I didn't like this film, but now I think it's pretty good. The DVD is somewhat spotty, as neither picture nor audio excels, and it comes with virtually no extras. I don�t think highly of this release, but I do like the movie and think it at least warrants a rental.